Mary Roth '18 points to a graph displaying the results of her neurobiology experiment. Friday’s end-of-term science and math fest, Posterpalooza, was a resounding success. As the smell of Ramunto’s pizza wafted through the halls of Dickinson, friends and teachers crowded around the many posters produced through this term’s projects and experiments. Math and science students, and even some math and science dabblers, stood proudly before their displays, eager to explain their methods and findings to onlookers. Shana Crawford and Emma Salazar, who head up the discipline as the Math & Science SEPC representatives, gave their input on the occasion. 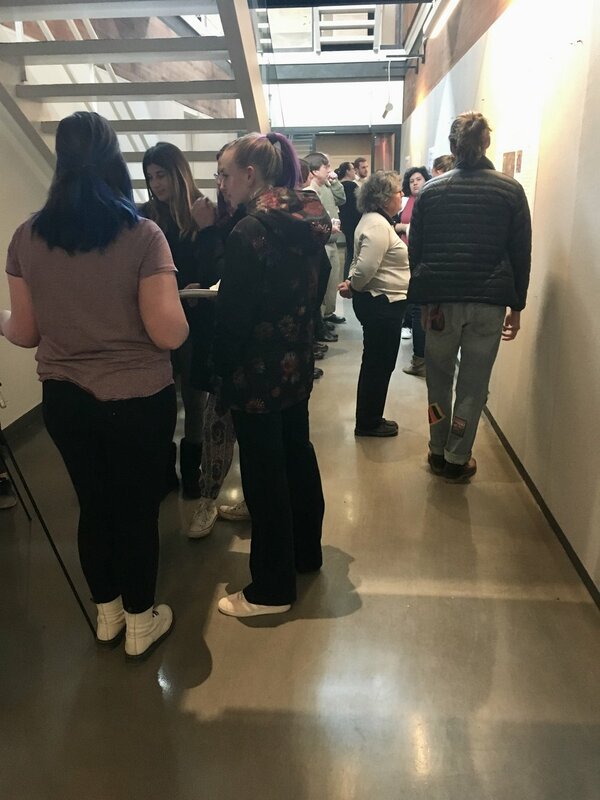 Students, staff, and faculty crowd the Dickinson hallway. A party indeed. The reading room tables were packed with pizza boxes and also some homemade treats -- notably, fresh bread from Tim Schroeder and John Bullock’s famous vindaloo. David Norman’s ice cream, prepared in a vat of liquid nitrogen, would become a spectacle later in the afternoon. But even this array of delicacies could not distract from what Dickinson’s community members were there to celebrate: the hands-on practice that typifies science at Bennington, and the astounding dedication of students and teachers to the scientific method. Alexander Ging '19 presents his Geographic Information Response poster to Dr. Betsy Sherman. Mary Roth '18 shows off her poster, while Amanda Bacon, '19, stands by. Dani Robbins '18 explains her poster to Olivia Judson, '17, while Chloe Amos, '17.5, munches on some pizza. If you missed it, these posters will be on display in Dickinson until the end of term.